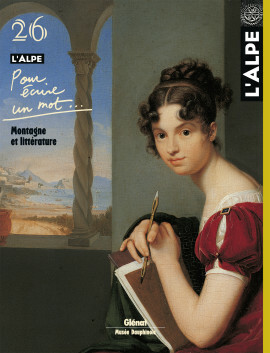 Written for people looking for information with meaning, L’Alpe is the first review devoted to the many cultures and heritages of Alpine Europe. Its ambition is to provide information, language barriers not withstanding. As your guide, L’Alpe looks at the people who, from the meandering Danube to the Rhône, have adapted to an exceptional climate. A cross between a book and a magazine, it draws on the first to provide background documents on a main theme, supported by rigorous analysis, an insistence on quality and the notoriety of renown authors. From the second, it adopts a quarterly rhythm for regular contributions to current debates, rich illustrations, the insatiable curiosity of its journalists and a necessarily didactic approach. Though rigorous in its approach to knowledge, L’Alpe is not a scientific journal. It calls on the contributions of history, geography, archaeology, ethnology, etc. to shed light on the meaning of the traces left by man on the mountain environment. And it is also open to current debates on the future of the Alps and other mountains in the world. The symbols of lofty elevation, summits are presented from many different angles throughout literature. The mythical home of the gods, a place of refuge and purification for the romantics or a challenge for mountaineers, mountains remain an allegorical figure that continues to inspire writers. In the blink of an eye, a small group of people are transported to the summit of the Mont Aiguille, in the Dauphiné… That is the beginning of the novel by Rétif de La Bretonne, a story of utopia in a style reminiscent of the Renaissance. In this surprising philosophical tale, the emblematic peak becomes the first « blessed isle » in a long journey to never-never land. For the romantics, mountains present a dual nature, accurately reflecting the contradictions of human sentiment. Destructive or welcoming, drifting in and out between shadow and light, the tortured landscapes serve as a backdrop for the agitation of the heart. An ambivalent nature lying at the core of many works. George Sand, from the flat Berry region, loved the mountains that she hiked avidly. The Pyrenees, Auvergne and the Alps were the setting for a number of her novels. In Lettres d’un voyageur, she recounts, not without humor, her Alpine jaunt in 1836. A perfect occasion, for the 200th anniversary of her birth, to discover a relatively unknown aspect of a woman who wrote, « I have a passion for vertigo, for heights and sheer cliffs ». By Jean Courrier. As his art evolved, Swiss painter Raphaël Ritz often revisited themes that he felt important. Proof is the famous oil painting on earthly and spiritual sustenance, of which there are three very different versions that Marie-Claude Morand analyses here in detail. Proust in the mountains ? The idea may see surprising, but the writer did occasionally leave the Parisian salons to travel to the Engadine valley, the Mer de glace and the banks of Geneva lake. A century later, visitors can soak up the atmosphere in these places where time would seem to have been suspended. Literary fiction has not made great use of the Alps. But whether they are considered in symbolic or concrete terms, as a backdrop for meditation or drama, for the stirrings of the soul or speculation on modernity, mountains offer an array of facets for the imagination of writers. A sample. The Tatar desert is one of mountains. In the work of the Italian writer as in his life, mountains occupy a central role and the Dolomites, his birthplace, are present under fantastic guises. As the setting for his chronicles and climbing stories, the summits often take on a truly metaphysical dimension. Everything started, as is often the case, in the Tschann bookstore near Montparnasse, my eye drawn by a superb photo by Fulvio Roiter showing wild ducks taking off, with a mysterious title, The year of victory, and the name of the author, Mario Rigoni Stern, of whom I had never heard. The name evoked southern Mitteleuropa, the region between northern Italy and the Danube, a realm more reminiscent of Claudio Magris than Musil. Such are the ways of happiness and the spiralling circles of reading. The great photographer sojourned in the Tarentaise valley in the beginning of the 1930s to prepare the illustrations for a novel by the editor-in-chief of the Nouvelles littéraires. La Fontaine de Siloé, a publishing house, discovered the document of which only a few images were known and did a remarkable job in presenting the photos. Le Sol is a worthy novel of the land with picturesque local characters. No more, no less. Frédéric Lefèvre, then the editor-in-chief of the Nouvelles littéraires, wrote about actual people from the Savoy, met during a stay in 1931 to take advantage of the good mountain air. In the course of the book, we meet Julie Guionnet, papa Guste or the priest that photographer André Kertész took in their village environment. Excepts. Describing mountaineering or writing it ? Does mountain literature exist ? A Melville of the Alps ? Though the summits are an invitation to take up pen and paper, the chosen are few and far between. There are however a small number of rare gems in the avalanche of climbing tales, picture books and various manuals for experts.